The impact of Master Data Management in an organization to improve decision making. This research deals with assessing the importance of Master Data Management in an organization and the impacts it has when making decisions. I will present the methodological framework which allows a centered master data to flow to different systems. This research will use the qualitative approach and interpretive paradigm. Years of using and retaining data in different data stores have led to conflicts in data descriptions, in the way data is structured, and the values of data, which makes it impossible or hard for an organization to understand and properly use its key data(Cleven & Wortmann). Data are used in almost all the activities of companies and constitute the basis for decisions on operational and strategic levels. Poor quality data will have significantly negative effects on the competence of an organization, while high quality data are often crucial to a company’s success (Haug, Zachariassen & van Liempd). Integrating those business definitions and data records across business lines and across subsidiaries is no simple task, demanding rearranging of data ownership and governance, however also requiring advanced technology for policies and business rules to be enforced(Scheidl 2011). The goal of MDM is to create and maintain consistent and complete business data for all stakeholders in a controlled and single-view capable manner across the whole organization which will help them figure out the improvement areas so they become more efficient and competitive. MDM is meant to provide organizations with the ability to integrate, analyze and exploit the value of their data assets, regardless of where that information was collected (Milanov & Njengus 2012). Organizations deal with different data which may be scatted across the whole organization where systems do not communicate with each other causing the organization to make decisions based on data that is not accurate. Master Data Management seeks to consolidate data that resides in various systems that do not communicate with each other, in such a way that accurate and up to date organizational data is available in a single place (Reichet, Otto, Ostele, 2013). Master data form the basis for business processes. 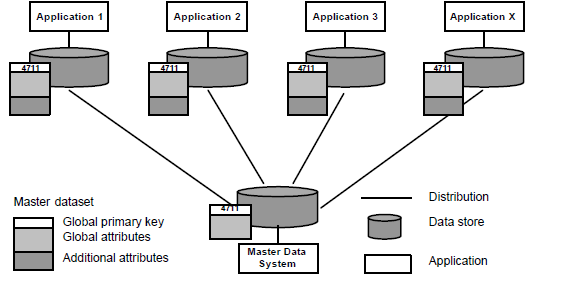 Master data represent a company’s essential basic data which remain unchanged over a specific period of time. Which include customer, material, employee and supplier data. Inconsistent master data cause process errors resulting in higher costs. With proper governance, the master data can be regarded as a unified set of data that all applications can rely on for consistent, high quality information (Hamilton G). This framework will allow master data to flow from the Master Data System to the applications, making sure that all applications use the same data. It ensures that the data used is always created the same way and is unique. Which will then allow all linked applications to use the centralized master data. How to maintain high data quality? When wrong data is identified in the system, some analysis would have to be performed to find out why it happened and how it can be prevented from happening again. The process of correcting the issues will take time and organizational resources. Having implemented MDM effectively, the following can be made from the evidence gathered. Hypothesis 2 (H1): Data inconsistencies are caused by the distribution of data ownership across different business and function areas and across IT systems. For this research I will use everyday decision makers so to get an understanding of how data influence the decisions that they make. After having the interviews, I will then summaries the whole interview by making notes of the key points that were given by the respondents. This will assist in making sure that I familiarizes myself with my research. In recent studies there have been increased focus on the importance of Master Data Management. This research contributes to the improvement of the scientific body of knowledge since it explores a part where only little previous study are available. Poor data quality means there will be difficulties where decision makers have to build trust in the company data. Therefore, addressing and integrating MDM at the start should be part of an operational excellence initiative, in order to solve part of the process inefficiencies. "Impact of Master Data Management." UKEssays.com. 11 2018. All Answers Ltd. 04 2019 <https://www.ukessays.com/essays/information-technology/the-impact-of-master-data-management.php?vref=1>. "Impact of Master Data Management." All Answers Ltd. ukessays.com, November 2018. Web. 19 April 2019. <https://www.ukessays.com/essays/information-technology/the-impact-of-master-data-management.php?vref=1>. UKEssays. November 2018. Impact of Master Data Management. [online]. Available from: https://www.ukessays.com/essays/information-technology/the-impact-of-master-data-management.php?vref=1 [Accessed 19 April 2019]. UKEssays. Impact of Master Data Management [Internet]. November 2018. [Accessed 19 April 2019]; Available from: https://www.ukessays.com/essays/information-technology/the-impact-of-master-data-management.php?vref=1.